I had never heard of the Astoria-Megler Bridge until we stumbled across it on our vacation a month ago to Cannon Beach. We drove north to check out the Peter Iredale shipwreck and then also the town of Astoria itself. But when I was passing by this bridge and saw all the wooden supports scattered around, I apologized to my wife and flipped a u-turn. It was an overcast day, so I opted for a long exposure and black & white processing. I loved that bridge. We drove over it later and it was kind of creepy to just suddenly be that high over the water…and then further down you can see it drop again and is level with the ocean. Creepier still was the fog that left us driving towards Washington but seeing nothing ahead of a road going into grey and water on each side. I loved the Cannery Pier Hotel on the left side and while I was intending to shoot only the bridge, I ended up really digging this comp. It helps give you an idea on the size of the bridge as a comparison. Oregon…endless possibilities of things to shoot there. I feel so blessed that I’ve been able to spend time in that state. It’s kind of amazing that you can get to this place in less than 30 minutes from the Portland airport. I’ve never been here, or down “The Gorge” and I have to say, it was utterly amazing. Waterfalls everywhere and such beauty. On my way back to Portland, I looked across the Columbia River to the north shore and saw sheer cliffs with waterfalls crashing down into the river…and it was like something out of Lord of the Rings or some fantasy movie. Even these falls…Multnomah Falls…with the bridge and the trees, seems like it’s from some dream. It was a foggy, rainy day. Which probably isn’t out of the norm for this area or Oregon in general. But I think it’s moreso like this in the winter months. Everything was wet. Everywhere. The sky was murky and foggy…the trees sometimes masked in clouds. When I got home and looked at these shots, I knew I wanted to do one in monochrome. It just felt right. This was a 131 second exposure using a 10-stop filter. I started this in Silver Efex 2 and then took it into Photoshop for some luminosity masking to add more detail. Love how it turned out. Make sure to click on it for the best effect. I left New York last October with a bunch of photos, but I’ve always come back to this guy as one of my favorites. I dig leading lines…or just lines in general, and this boardwalk along DUMBO had them aplenty. The boards themselves, the railings, the benches…and then the massive Manhattan Bridge in the background. This is a long exposure processed simply with #VSCOFILM. Thanks again to my buddy Rick Young for letting me borrow his B+W 10-stop and drag it not only to New York, but also on a follow-up trip to Oregon. That dude is one of the best people I know. I have a bunch of other random shots from NYC and at some point soon I plan on throwing the rest of them into one giant blog post. It’s probably about time. But maybe enough time has passed by? This was taken on the Manhattan side of the Brooklyn Bridge. You can see the Manhattan Bridge off in the distance. I have to give some credit to my buddy Brian Matiash for giving me the idea to jump over the railings here to setup a shot on the beach. I tend to take what is given to me sometimes, instead of going for the shot that no one else is thinking about. I love the way this turned out. I had a 10-stop filter on my lens for 292 seconds and it was kind of a tough shot with the light falling quickly and my inexperience with that filter. There is some graininess to it which I dig and it actually looks quite fantastic on the canvas. So I was in New York last Thursday through Sunday, and here I am sitting in a hotel in Corvallis, Oregon. New York was a vacation, Oregon is for my day job. Looking forward to my off-hours in Oregon though, as I plan on hitting the coast a few times, starting tonight. Since I don’t have a lot of time, I wanted to pass on an image from my trip to NYC. This was taken at 7:25am in Brooklyn Bridge Park. I was there along with a few other amazing photographers and I’ll talk about that whole part of it on another post. Lack of time today. But I have a ton of portraits of the guys I met and I can’t wait to share them. This shot includes the Manhattan Bridge, which sits east of the Brooklyn Bridge. I love this little boardwalk and the sun peeking out from under the bridge. The light was amazing. Click on the image to view it bigger with the border, think it adds a lot to the viewing experience. Yes, it’s man-made, so it’s not exactly awesome, but we do have a lake in the middle of the Valley called Tempe Town Lake. It’s actually the Salt River, but a dam has been built to make it a recreational area. We hit this spot for our latest photowalk on June 10th. Spanning the lake are quite a few bridges and there is also a new pedestrian bridge being built that will demand to be photographed whenever it’s completed. Has a cool looking design, so I can’t wait to see it done. But anyways, in the heart of the lake are the dual Mill Avenue Bridges, the Light Rail Bridge and this old railroad bridge. This photograph is of that ancient giant beast that still carries train across it. It’s so old though, that you could walk up to it, think it’s out-of-use and then decided to cross it only to get flattened by a speeding freight train. The first time I ever walked on its tracks I didn’t think it was still in service. 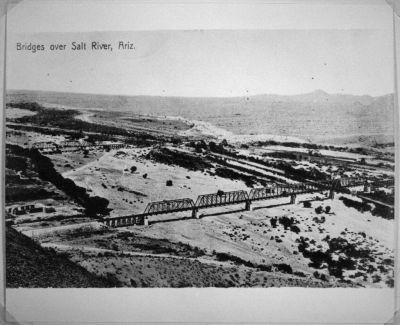 The bridge is called the Arizona Eastern Railroad Bridge. Check out this picture from the year 1900 (there are a bunch more here). Incredible. I honestly had no idea it was THAT old. I love seeing these shots of Phoenix and the surrounding cities before anything really existed. There were a ton of shots I could have done of the bridge and I’d like to go back actually and fine some more, but standing up on this slope I had an awesome view of the base of the iron support stretching across the lake into infinity. In hindsight I may have used a narrower aperture to get a bit more detail further down, but I also really enjoy images that take a slice of detail and keep that area in focus, blurring the rest. I’m exhausted, I must say. Four hours of yardwork on Saturday resulted in a bit of a sun burn. Sunday I joined my buddy Rick Young in shooting a destination beach wedding in Los Angeles. More sunburn. Flew in at 7am, got home around 10:30pm. Last Thursday I was notified that I was needed in Vegas this week for my day job, so today I was up at 4:15am after hitting the sack around midnight. And here I sit in the little control room wanting to focus on work, but I’m tired, cranky and miss my girls back home. So of course I figured why not write up this blog post real quick, since I haven’t had anytime to do it before now. I love this image. It was taken on our trip to the Two Guns ghost town back on April 2nd. To get in this spot, I hiked down an animal-created path that was made up of a combination of deer prints and perhaps a few bear prints. My buddy Ken Peterson told me I’d probably get bitten by a snake while down here too. Lots of tall, dead things. It may be hard to tell, but all those tall branches at the bottom of this image were over 12 feet tall at least. But I saw this bride out in the distance and wanted to see what it looked like underneath. The aforementioned Rick Young has a great shot of the bridge from far away right here. I love how he applied a bit of Focal Point foreground blur to make the image pop. I liked this angle though and am glad I made the hike to get here. A beautiful, old bridge and one of the main reasons I wanted to visit Two Guns in the first place. I participate in a group of awesome photographers that take a set of brackets from one of us and then process it in our own creative way. Then we post the results and get fans on our Facebook page to vote and choose which one they like the best. Fans of the page can also download the brackets and put their spin on it at all. A little friendly competition is good and healthy, and definitely a lot more fun when you WIN! We call it HDR Tennis and the image above was my entry…which turned out to be the winning one and I’m proud of that. It’s a tough group…a very tough group and thus nailing an image that people love just a bit more than the others is an accomplishment. The brackets were donated by Peter Talke and are obviously of Big Ben in London. The original 0 bracket is below. I processed it all using onOne Software after I did the tonemapping in Photomatix. Used a couple of filters to bring out shadows and details, then converted it to B&W and then applied a textured border from PhotoFrame to finish the image. Immediately when I saw the original picture I knew I wanted to make it look like an old postcard if I could. The hardest part was choosing the right frame from the literally hundreds and hundreds of options that onOne gives you. You can see the other entries in our Facebook album right here. This is the 7th Avenue bridge over some railroad tracks set just north of Grand Street. One of my recent excursions exploring the south side of downtown Phoenix brought me underneath this gem of a structure, complete with grunge and oldness. I tend to look for symmetry and lines in a lot of my images. It’s a running theme I guess…railroad tracks, roads…the belly of bridges…give me depth and disappearing lines and I am a sucker for it. What struck me about this bridge when standing under it (quickly firing brackets in the utter quiet, trying not to freak at every noise I heard), was the stained streaks of some liquid running on the underside of the bridge. At first I didn’t get it, I thought the wind must have done it when it rained, but I realized the bridge just curved down towards me, so any rainwater that seeped through the cracks would end up running towards each end of the bridge. It’s kind of interesting to think that these trails of water stains have probably built over time, and whenever it rains, the liquid tends to follow the same path, almost like a system of creeks formed in a roof of cement. I could see these streaks while standing there of course, but I accentuated them a bit in post to really highlight them.